Aisha Geissinger, Ph.D. (2008) in Religious Studies, University of Toronto, is an Assistant Professor at Carleton University (Canada). Geissinger’s research is located at the intersection of the study of the Qurʾān and its exegesis, the Ḥadīth literature, and gender. A number of classical Sunnī Quran commentaries quote several different types of exegetical materials attributed to a few female figures from the first century A.H/seventh century C.E.—āthār, ḥadīths, legal opinions and variant readings, as well as lines of poetry. 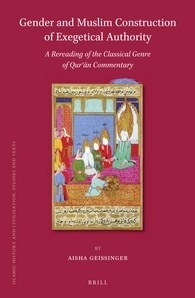 In Gender and Muslim Constructions of Exegetical Authority, Aisha Geissinger provides a comprehensive introduction to such quotations, and offers an analysis of their place and significance within the pre-modern genre of Quran commentary, demonstrating that key hermeneutical concepts in classical quranic exegesis (tafsīr) are gendered. Bringing together materials which have not previously been examined in detail and utilising gender as a lens through which to study them, this work provides a new approach to the study of pre-modern tafsīr.